If there’s one thing you know about me, it might be that I love cheese. People often tell me that they love my recipes because they involve so much cheese… what? Really? Apparently a normal amount of cheese to me is a lot to other people. Whoops. Anyway, when the Gouda Cheese Shop asked if I’d like to try some of their cheeses, you can imagine how long it took me to say yes (I think I got keyboard-burn on my fingers). I loved the look of their site – it’s a cheese delivery service!! Let me reiterate: cheese, delivered straight to your door. You literally only need to walk to your front door before returning to your sofa to eat your block of cheese. Now if only someone would start a chocolate delivery service, I’d be set for life (and probably the size of a bus). 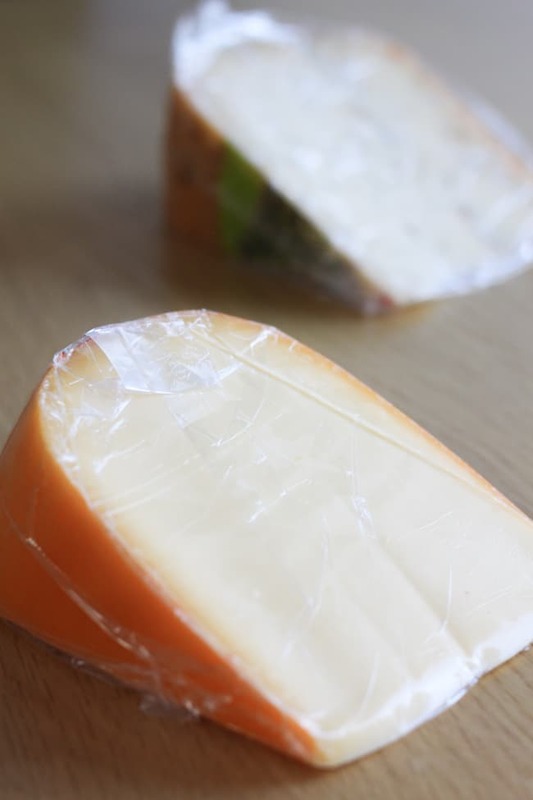 The cheese comes vacuum-packed, and then wrapped in the plastic you can see below. There’s an incredible selection – I went for a semi-matured Dutch gouda cheese (at the front) and one with Herbes de Provence (at the back). They are both absolutely awesome and I love the fact that they’ve been sliced out of a big wheel. 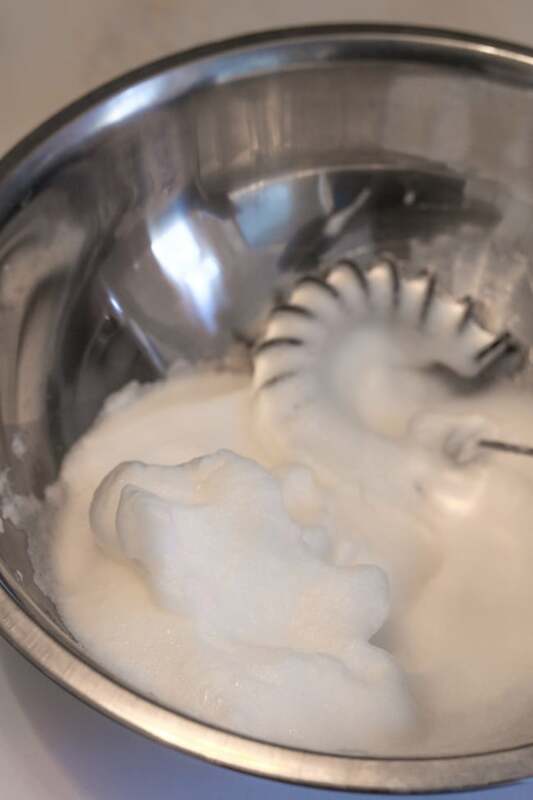 It started out the same as any other soufflé recipe – egg whites whisked to the point that you can sculpt them like you do with bubbles in the bath (surely it’s not just me who still thinks a bubble beard is the best part of having a bath?). Then gently fold through a cheesy sauce and some mashed avocado, being really careful to keep as much air in the mixture as you can. I omitted the usual egg yolks, using the avocado instead. Now I’ll admit, this soufflé wasn’t restaurant-quality. It did rise beautifully, but totally sank when I took it out of the oven. Any tips for keeping a soufflé up? I’d be keen to try it again using some tips from you clever folks. The flavours, though, were spot on. The gouda was the perfect mild, nutty cheese to work alongside the avocado without overpowering it, and the bit on top where the cheese had crisped up was just delish. 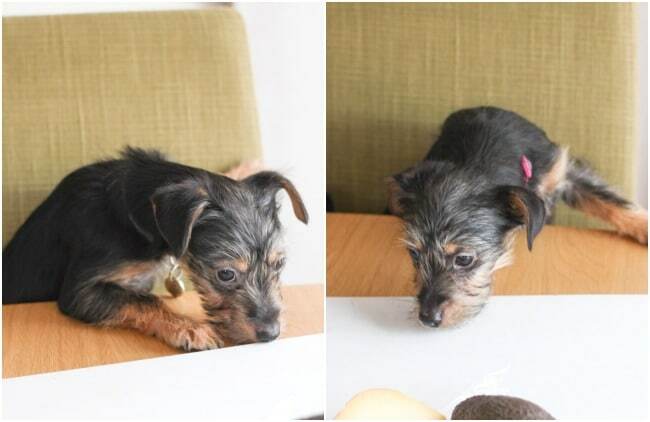 By the way, since I know some of you are totally in love with my puppy, I thought you might find this funny – she’s figured out how to climb up on a chair to see onto the table where I take my photos. Any day now she’ll work out how to reach an arm out and it’ll be game over. 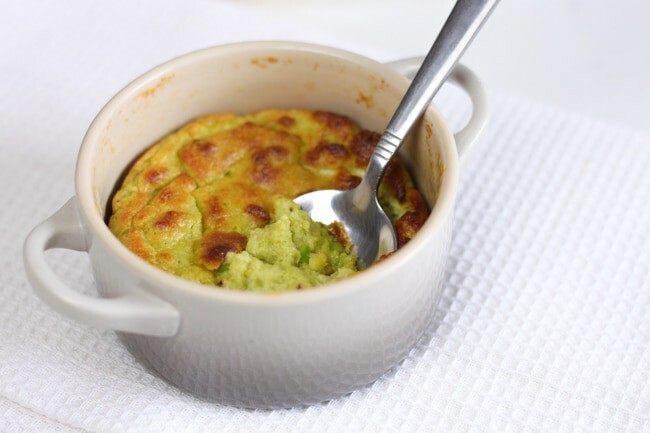 Anyway, give this cheesy avocado soufflé a go (nosy dog is optional), and remember to share any tips you have about keeping them up! Melt the butter in a saucepan, and add the flour. Whisking constantly, cook for a minute or so over a fairly low heat. Add the milk gradually, whisking until smooth each time before adding more. When all of the milk has been added and the mixture is smooth, add the grated gouda cheese and plenty of black pepper, and cook for a couple more minutes over a fairly low heat, until the cheese has melted. Separate the eggs, and discard the yolks (or save for a different use). Whisk the eggs until they form stiff peaks. In a separate bowl, mash the avocado with a fork until smooth. 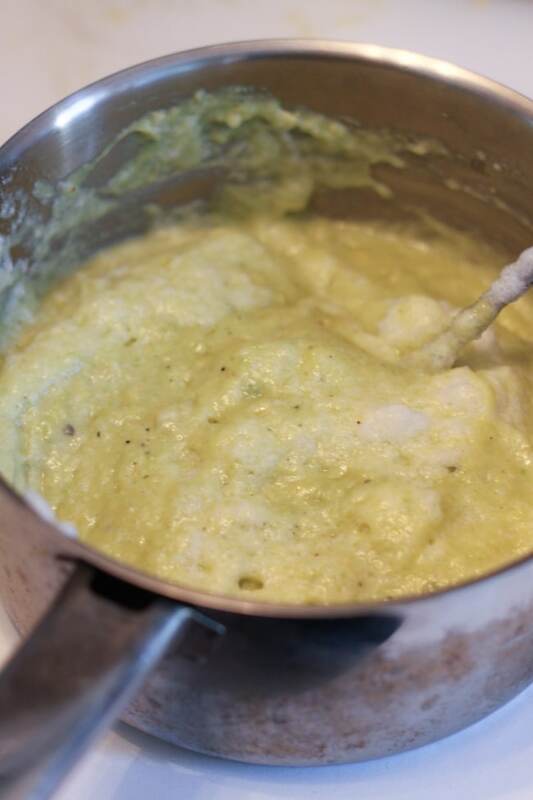 Add the mashed avocado and the cheese sauce to the whisked egg whites, and very gently fold the mixture together until well combined, making sure to keep as much air in the mixture as possible. Thoroughly grease three large ramekins, and distribute the mixture evenly. Place in the oven for around 20 minutes, or until the soufflés have risen well, and are crispy on top. Serve immediately. That looks amazing. I see things like this and I think “oh my gosh” but then I tell myself that I just don’t have that kind of time. However, I am determined to start making time. Thanks for the inspiration. Becca, this is wonderful! Will give it a try this Thursday, in my work from home day; thats the perfect lunch!! Thank you!! For a busy mother working 40 hours weekly, this kind of recipes are a life-saver! Aw you’re too sweet, thanks so much for all your lovely comments :) so glad you like my recipes! It looks like you ever-so-slightly overbeat your whites. You want them to be stiff but not dry – it’s hard to tell in your picture but it looks like they are just past the turning point between “stiff” and “dry”. Also, the egg yolks may have been the key to the structure staying puffy, but I’ve never substituted avocado for egg yolks before so I don’t know what the avocado may do structurally that is similar to yolks. It’s a good idea though! I can’t wait to try! I seem to remember learning that a pinch of bicarbonate of soda will stop a soufflé from sinking, but it’s some years since I made one. That site – I can buy my favourite Gouda with cumin. This may not end well…..
Gouda with cumin sounds interesting! Go for it! 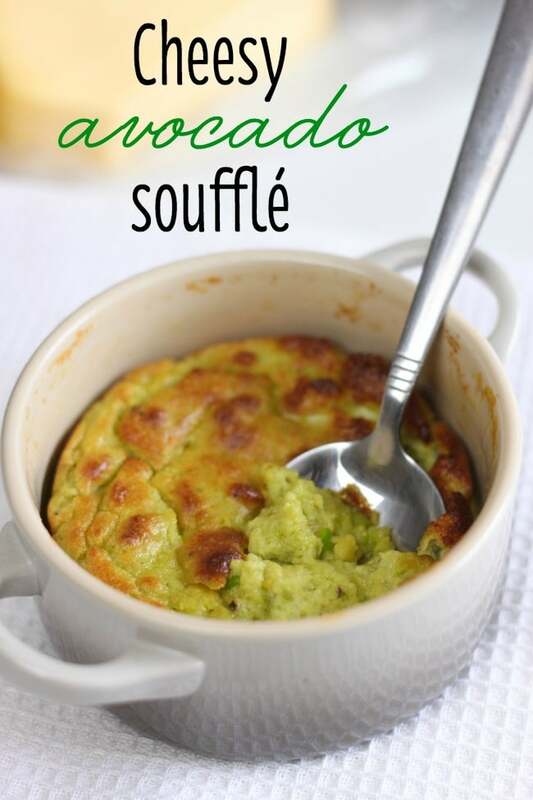 Kudos for inventiveness and creativity because I’ve never heard of an avocado souffle before! A cheese delivery service sounds just about perfect. I haven’t seen anything like this before! Looks so good! I have never made (or tried) a souffle before.. you have inspired me! Lovely photos and cute pup! Cheese… avocado… egg… what could go wrong?! Love the sound of these babies! Yum – this souffle looks great. Bubble beard souffle! I haven’t done many souffles to give any advice. They can be tricky but yours still looks so delicious!! 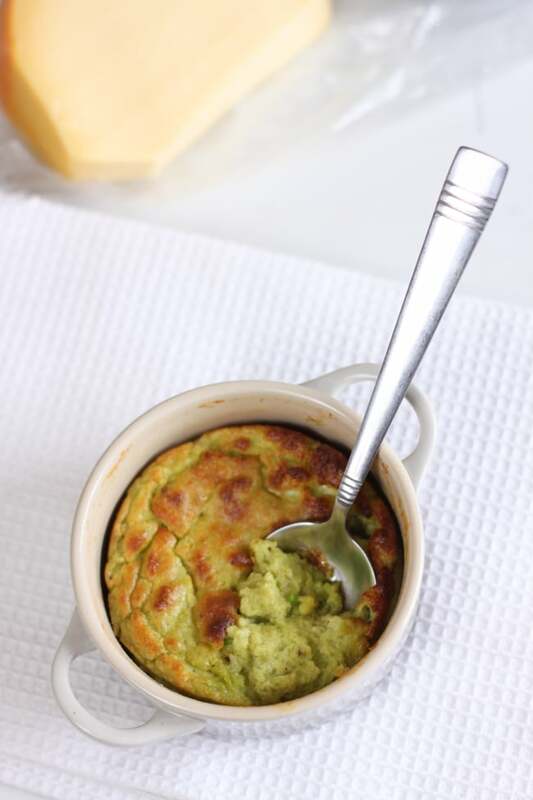 What a great idea to use avocado in your soufflé. It sounds delicious. In terms of the rising issue, I wonder if part of the issue is the slippery sides of the dish give the soufflé nothing to hold on to once the hot air from inside starts to dissipate. I have seen soufflé recipes where they use fine breadcrumbs to coat the butter on the sides of the dish, which may give a surface that the soufflé can hang on to. I am pinning your recipe on my to make board. Thanks! Cheese delivery service, where do I sign up?! 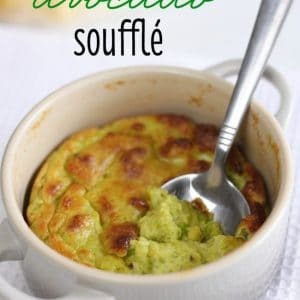 I would never have thought about using avocado in a souffle, sounds tasty though. I’ve made souffles a couple of times and they rose well, albeit in a wonky way. I wonder if maybe the avocado is a bit too heavy compared to egg yolks which is why it sank back? Oh yumm! I haven’t ever dared trying soufflé yet, but if you’re posting recipes using Dutch stuff, how can I not try them? ;) Avocado AND cheese, what’s not to love? 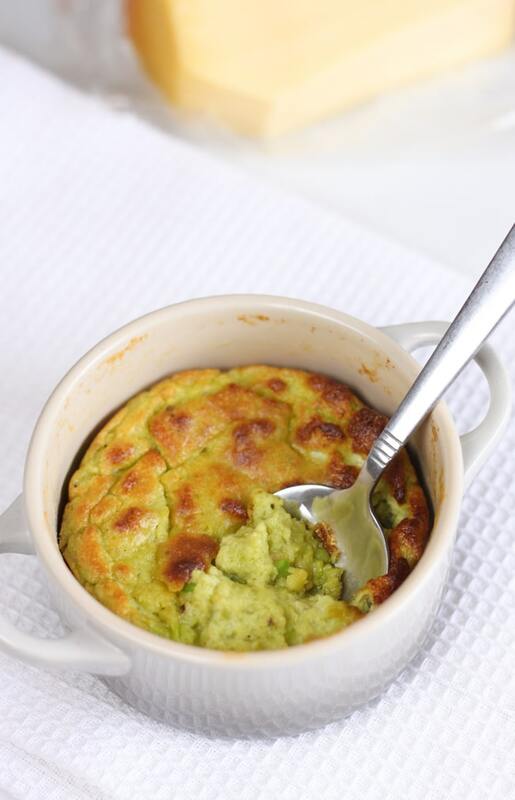 I would never have thought of avocado in a souffle! 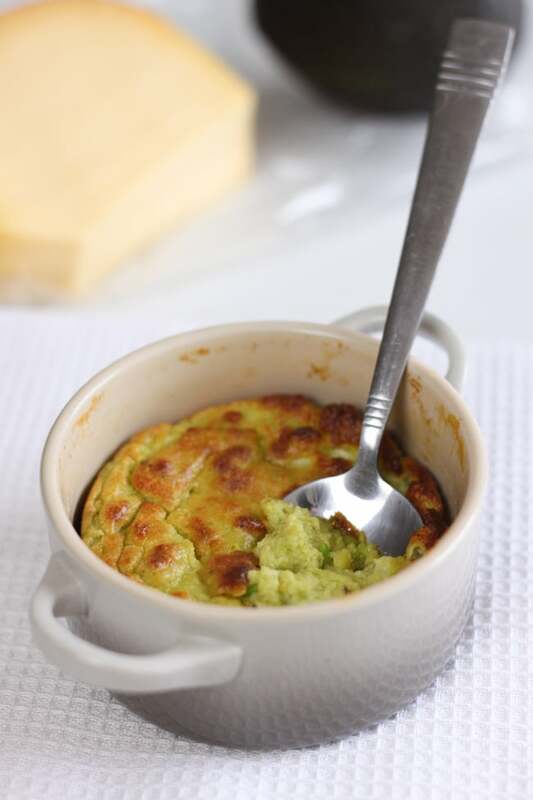 Avocado and cheese in a souffle? Oh yes please. Hi Becky, if only we had a similar cheese delivery service in the Netherlands where I could order all the lovely British cheeses I love so much! Thanks for all your inspirational vegetarian recipes!